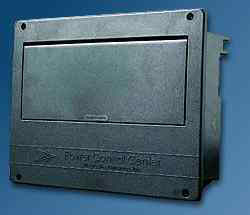 5500 Series Flush Mount AC Distribution Panel The 5500 Series 50 Amp, 120/240VAC Power Distribution Panel. Compatible with 6000 Series DC Power Distribution Panel. Press open door for easy access to circuit breakers. AC Panel will hold a 2-pole dual 50 Amp main plus up to 16 branch breakers (not supplied). AC Panel features 12 built-in push and lock Romex® strain relief connectors. Attractive light weight panel design made from impact-resistant, high temperature, polymers. AC Panel designed with large front wiring compartment. Optional: 15 Amp/120VAC outlet on rear of AC Panel.